I love crab, I prefer the taste much more than it’s more revered and expensive cousin, the lobster. This recipe makes a great starter or lunch and it can be made ahead of time, In fact I recommend to leave it for a couple of hours in the fridge to let the flavours develop. The recipe below serves 2 people and it uses 1 dressed crab. Chop the ginger, shallot and garlic as finely as you can and add to a bowl followed by the crab meat, slice the chillies and stir in to the mixture. Finely chop a tablespoon worth of corriandor and add to the bowl along with the white wine vinegar. Taste and season with salt and pepper. If you like it with more of a kick add a dash of tabasco. Deleaf the cos lettuce, the outer floppy leaves, Use a knife to cut away the hard stalk ends. 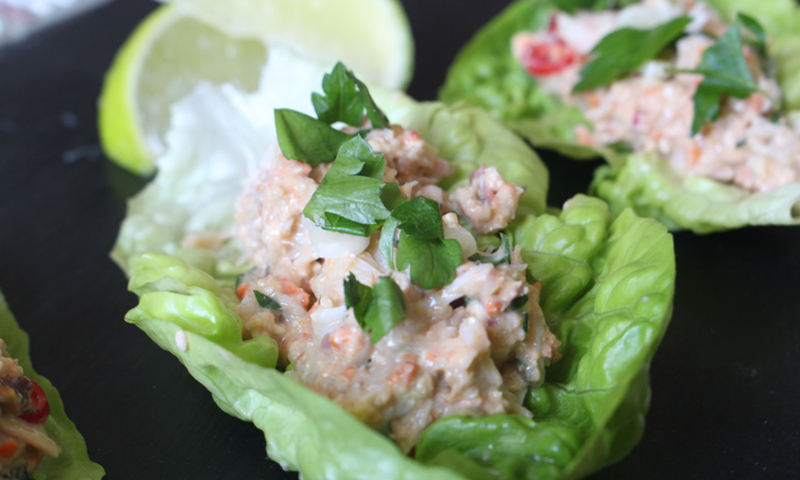 Place each leaf of a plate and add a heaped spoonful on the crab meat. Slice the spring onions and roughly chop the remaining coriander and sprinkle over the crab meat mix. Serve with lime wedges and get stuck in with your hands.